Patty & Emily sat down with Molly Pope, neoretro cabarettist! They talk about high school theatre, love of all things vintage, and most importantly, Molly’s new show at The Duplex, Molly Pope Likes Your Status on March 13th at 9:30pm. If you can’t see her then, she’ll be at The Duplex every second Tuesday of the month. Go see her! Michael McCorry Rose and Tiffany Haas at Birdland! When Michael McCorry Rose and Tiffany Haas met on the Wicked tour, the two of them had an instant friendship. He was drawn to her “infectious personality” and she to his “killer sense of humor.” They also realized they had a love of classic musical theatre, something that struck them as interesting since they were in the middle of this very contemporary musical tour. So the idea of their show, Cheek to Cheek: A Broadway Romance, was born. A show that would be filled with all the songs they love to sing. But things really started taking shape when Michael was chatting with an NYU theatre history professor, John Kenrick. Michael and Tiffany didn’t just want to do a concert and sing classic Broadway love songs, they wanted to tell the story of Broadway romance. They wanted to explore what was happening in the composers’ loves lives while they were writing these iconic songs. Tell the stories of the romance behind the music. And Professor Kenrick had those stories. So, yes, you can expect to hear Rodgers & Hammerstein, Jerome Kern, and the Gershwins. But you will also hear how the Gershwins used to arrive at parties, claim the piano, and entice young ladies to join them. Then drawing from their repertoire of songs, they would pretend they were composing a song on the spot for whichever girl was sitting there. They would ask the girl’s name and as Tiffany put it, “insert the three syllable name into the tune that has the three syllable name.” What other salacious (or sweet) stories will we learn about composers from the Golden Age? You’ll have to come to find out! Tiffany Haas: I don’t know her. But fun fact: When I was living in New York City, a little side job that I had was a reader for auditions at Telsey. And I only did it for one show, but I was the reader for The Drowsy Chaperone. So I read opposite for her, and Sutton, and Danny, and all these amazing people who were coming in. And I’m just sitting in this chair, reading Adolpho lines for Beth Leavel. I remember, she came into the room in character. And [director Casey Nicholaw] got a kick out of it because he knows her. And it was an upright piano, not a baby grand, so it’s not like there’s room to lay. So she created room to lay and as the accompanist was playing, she crawled up onto the piano keys. I’ll never forget it. It was unbelievable. Michael McCorry Rose: Well, I mean, how am I going to beat that story? We just did a reading together a couple of months ago, and actually this morning we were in a recording studio recording demos for that show. So, we’ve worked together, but she’s not a close personal friend, but I am a fan. TH: I mean, I know it’s so weird, but, Bridges. And any Rodgers & Hammerstein, and Jerome Kern. Oklahoma, Carousel, Show Boat. MMR: This isn’t even a show for me, but I just think it’s a perfect musical. When was the last time The King & I was revived? P&E: It’s coming back! The last time it was on Broadway was in 1984 with Mary Beth Peil. Have you ever fallen asleep on stage while pretending to sleep or be dead on stage? TH: Wait, was that a question? No. I have in yoga during shavasana, but not a show. MMR: I’ve got my answer. It’s just fresh in my mind because I went to go see Hedwig the other night. And the remodel on the Belasco is just so impressive, it’s just stunning. TH: I’ve got a soft spot in my heart for the Gershwin Theatre, where Wicked is. It was my Broadway debut, and I actually saw Show Boat there, and it was my first Broadway show experience. So that theatre holds so much oomph for me. MMR: I have a question. Can I go back and make another answer? This occurred to me when Tiffany was talking. I was at The Music Box seeing Dead Accounts, and the house manager asked if I had ever been to Irving’s office. And I said, “No. What’s that?” So he took me up to Irving Berlin’s office. He was the owner and built the Music Box. So, he had this speakeasy that he built in his office; it was sort of through a hidden door. So the house manager goes in and does this elaborate series of pushing and unlocking and prodding and shifting and all the sudden this door pops open. And you put your head in, and down through this long, slender hallway — it’s a hallway that’s dimly lit and not finished — but it basically looks like a stone bar, enough room for a bar stool and someone to walk by. And it was a speakeasy during prohibition that he built in there that you could only access through his office. TH: I mean, if I had to do one for an audition, I would have to go through my stuff and find whatever last one I did. MMR: I do. Well, I take a scene study class once a week, so it’s easier. TH: I think mine is Cats. My mother owns three dance studios, and she would come and see Cats all the time and bring me with her. I think it was something like 8 or 9 times? I know for a lot of Broadway people now, especially for a show like Wicked, if you’ve seen it 8 times, you’re not a real fan. But I think that’s it. That or the Radio City Rockettes. MMR: I did go back a few times to that revival of South Pacific at Lincoln Center a few years ago. I kinda kept going back. P&E: Who would you fangirl/boy over? TH: Um, Kelli O’Hara. She’s a beauty. MMR: Mine’s Audra McDonald, and here’s why. When I was at UCLA, she came to do a concert. She started the set by doing two gorgeous songs, and she’s in this evening gown, and just elegant, seeping with class. And then she said, “I just have to tell you I just flew in from New York and immediately stopped at In-N-Out on my way from LAX and got a Double-Double animal style, so if I start burping during this concert, I apologize in advance.” It just won us over because she’s just so beautiful, and it was the last thing you thought someone like that would say. And that was kind of my first introduction to her. And just through the years to see how virtuosic her career has been, to me is inspiring. Someone that seems equally at home in plays, in Shakespeare, certainly in musical theatre, opera. I mean, that’s truly a Renaissance actor to me. So that’s the one I’d probably freak out over. Well, I have met her a couple of times, and I just sort of didn’t say anything for fear of saying everything. TH: I’ve never seen it. P&E: Good. Don’t go on it. It’s evil. MMR: I have say the same thing. Once a few years ago, I saw a message board — I don’t think it was Broadway World; it was something else — and saw something about someone I know that was so deeply upsetting, so I just don’t read those for that reason. TH: Oh, yes. I would see Judy Garland’s Carnegie Hall concert. MMR: I would go back and see the first production of The Merchant of Venice. I’m just curious. People say Shakespeare was presented so much differently originally, and that the audiences were different, and that the language was different and fell on the ear in a certain way, and that it wasn’t the scholarly pursuit that it is now to go and watch Shakespeare. So, it would be cool to go back and actually experience that in real time. Clearly, these two are full of their own great stories, so you can only imagine what they’ll do telling the great romances of Broadway’s classic composers. And speaking of romance, Michael agrees with Tiffany about a revival of The Bridges of Madison County, and they’ll both be available when it happens. We’ll definitely be there to see that, and we’ll be at Birdland on Monday, May 19th at 7:00pm for Cheek to Cheek: A Broadway Romance. Get your tickets here! At the intersection of classic musical theater and contemporary classical music, Sarah Taylor Ellis and Lane Williamson’s vernacular art songs cut to the core. Their smart and contemplative music encompasses settings of prose, sonnets, and tumblr posts, and their new chamber musical The Yellow Wallpaper adapts Charlotte Perkins Gilman’s early feminist short story into a haunting theatrical work. Join Ellis and Williamson for the 54 Below debut of a distinctive new songwriting team. Intersections features Michael Parker Ayers, Christina Benedetto, Sally Eidman, Camden Gonzales, Karen Hayden, Rachel Lee, Travis Leland, Mary Kate Morrissey, Rachel Sussman, David Alan Thornton, Rebecca Tucker, and Max Vernon. AND, we have a promo code for you! Use EW54BLOG for 20% off the cover charge! So click here for tickets. We’ll see you there! Hey Shmazettes! I (Emily) had the great pleasure of attending Jay Kuo’s concert on Monday night at The Lambs Club. The evening was a mix of songs from his catalogue, leading up to several songs from Allegiance. First off, The Lambs Club is suuuuper nice and swanky and has a great old New York atmosphere. I don’t know what their regularly scheduled events are, but I would love to attend something else there. The prices weren’t too bad either: the cover charge was $30 and there was no minimum; the menu was a bit pricy for my taste. Honestly, when I first got there I felt a little underdressed and out of place, but George Takei was there so I knew everyone was welcome! Check out this video of her singing ‘Higher’ during her American Song Book concert at Lincoln Center. We can’t wait to see Allegiance on Broadway! In the mean time to hold yourself over listen to lots of Lea Salonga and scour YouTube for as much Jay Kuo as you can find. I know I will be! Also keep up with the show by following Kuo and the show (I can rhyme! I’m going to write musical theatre!) on Twitter! 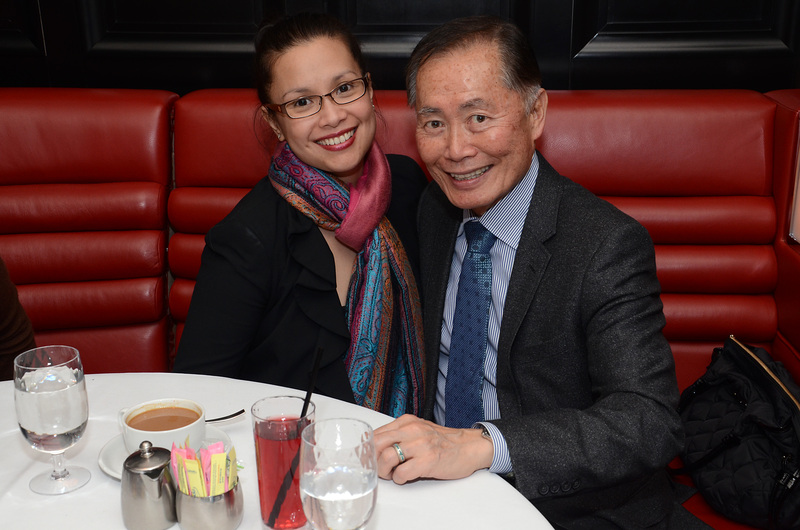 I’m going to assume you already follow Lea Salonga and George Takei, but if for some crazy reason you’re not….